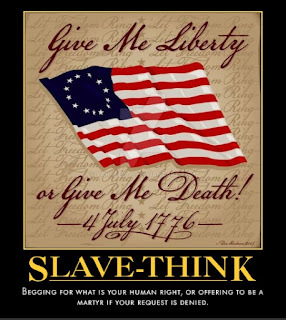 "Give me liberty or give me death!" Wait, what? "Give me liberty or give me death!" is a stirring sentiment, but it's wrong. No one can "give" liberty to another. They can respect it or violate it, but it's up to you to live it for yourself. And if someone doesn't respect your liberty, but chooses to violate it, why give them the option of killing you as an easy out? How is that good for you? My cry would be: Respect my liberty or face the consequences. Reminder: I know everyone is tired of hearing it, but I'm still in trouble and could really use some help.